-[W]hat was the Paris meet about? 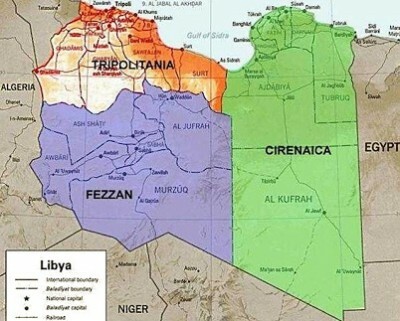 Quintessentially, the western interventionist powers, having brought about the ‘regime change’, now want to consolidate their grip on Libya’s oil resources and to this end want to install the NTC in power in Tripoli, which of course needs lots of money — and Europe is broke. France and Britain seek that the billions of dollars in frozen assets belonging to Libya to be vested in the TNC’s hands. But that position was fortnight-old. The government is yet to reveal that it took a U-turn in secrecy and decided to identify with the western intervention in Libya. Even the Indian parliament, which was in session, didn’t know that the minister of state for external affairs E Ahmed attended the so-called ‘Friends of Libya’ conference in Paris on September 1, which was convened by France, the interventionist power that spearheaded the assault on Libya’s sovereignty and territorial integrity in flagrant violation of international law. Whether the volte-face was due to Nikolas Sarkozy’s charm or a diktat from Washington (or both), we do not know. Perhaps, two or three years hence WikiLeaks might throw some light. Meanwhile, Ahmed’s flight to Paris signifies a major shift in policy. True, Muammad Gaddafi’s regime has been overthrown and there is need to look ahead. It is nobody’s case either that India’s ties with Libya should be put in a deep freezer until the looming civil war finally gets over. Nor is it questionable that India has substantial interests in Libya which need to be safeguarded. The big question is how India should go about meeting the developing situation. Our government argued when Resolution 1973 came up in the United Nations Security Council that India’s position would be largely guided by the stance of the African Union (AU) on the Libyan question. Subsequently, prime minister Manmohan Singh demonstratively displayed India’s solidarity with Africa when he made an extended tour of that continent and attended an AU-India summit meeting in Addis Ababa. The spin doctors hailed Singh’s rhetoric as historic. In retrospect, it seems the Indian statements were vacuous. The point is, the AU stubbornly refuses to accord recognition to the National Transitional Council or TNC (which is how the disparate elements who are Nato’s pawns in Libya are collectively described.) For the AU, Nato’s intervention in Libya evokes collective memory of the colonial era. The AU ignored Sarkozy’s invitation to the Paris meet. The government owes a decent explanation as to what prompted it to dump the prime minister’s flowery rhetoric in Africa about India’s common destiny with that continent. The Paris meet was a grim victory celebration by the Nato powers. In order to give legitimacy to what lies ahead, the Nato powers want poodles from outside Europe to get into their bandwagon. India needs to ponder about what is happening. India shouldn’t have been party to the processes under the rubric of ‘Friends of Libya’. India should rather insist that such processes for cauterising the Libyan wounds should be the UN’s business. The western interventionist powers are bypassing the UN and insisting that Nato will remain in Libya for an indeterminate period. Most certainly, India needs to maintain contacts with the disparate elements vying for supremacy in Libya. But then, their representatives could be invited to visit Delhi so that India’s concerns can be appropriately registered with them. By all means, render humanitarian help to the Libyan people. But India does not need Sarkozy or David Cameron as mediators. Nor should India be oblivious of the stance of the AU. India should synchronise its stance with the AU’s. It will be a principled stance and it will be in consonance with the promises and hopes held out by Manmohan Singh in his celebrated Africa tour, which still lingers in memory. Finally, India should thoughtfully begin to assess the far-reaching import of what is unfolding in Libya. India has consistently argued that the struggle for change has to be peaceful and non-violent. That was how the Shah of Iran was overthrown (1979); Marcos in the Philippines (1986); the East European regimes in the 1980s; and Suharto in Indonesia (1998). On the contrary, the change in Libya is taking place through unilateralist western military intervention. It raises fundamental questions in global politics. Are we hearing the footfalls of history all over again — the ‘white man’s burden’? We too have been, historically speaking, victims of the predatory politics of the western powers in their scramble for scarce resources in the Global South. Before dispatching Ahmed under a veil of secrecy to Paris, the government should have consulted the Indian parliament.